At One Mindful Yoga, we seek to encourage a Yoga practice that heals us emotionally, physically and mentally. 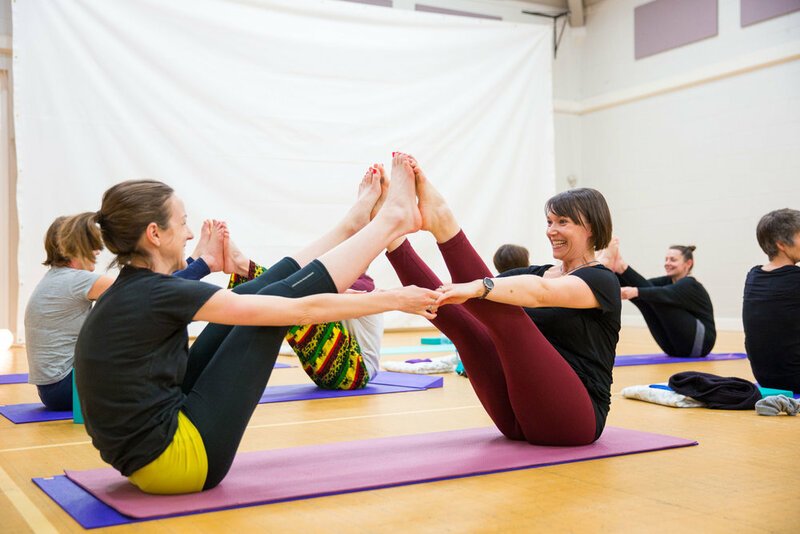 Based in York, One Mindful Yoga offers a variety of yoga practices from Vinyasa Flow classes to Yoga therapy sessions and a unique 8 week course for stress, anxiety and depression. Practicing yoga gives us the opportunity to be aware of the breath, awareness of movement through asana (postures) and notice our thoughts through a meditation practice. When we become more aware of our thoughts and actions we have the power to transform our lives by being less reactive and instead become more confident, communicate more effectively and build stronger relationships. Yoga is known for its ability to ease stress and promote relaxation. One of the key reasons for this is partially from bringing a balance to the autonomic Nervous System. By doing strong physical asanas (postures) that lift the nervous system followed by asanas that induce a sense of calm, that lower the nervous system we are bringing the body and mind back to a state of equilibrium. Pranayama practices, like coherent breathing can also help measure autonomic tone by doing the same breath ratio. When we slow down the breath with consistency, we activate sensory fibres in the lungs that tells the vagus nerve we are relaxed and sends this message to the brain via the vagus nerve. The more we slow breath the more the vagus nerve becomes toned and therefore become less stressed and emotionally upset building on more resilience overcoming difficult situations more calmly. Almost every yoga pose takes your joints through a wide range of motion, making them stronger, more flexible, and able to absorb more impact without leading to pain or other problematic conditions. From a psychological standpoint, a more relaxed and limber body leads to a calmer and clearer mind. Your mindset can reflect the tension in your body, so releasing muscles can only help you gain an equally tension-free mind. This is due to the mechanism of the stretch response. Yoga is a great practice in order to build and tone muscles throughout the body. A recent study found that 79 adults performed 24 cycles of sun salutations — a series of poses often used as a warm-up — six days a week for 24 weeks. They experienced a significant increase in upper body strength, endurance and weight loss. Yoga also increases muscle endurance because you typically hold any given pose for a period of time and repeat it several times during the yoga practice. Moreover, this can teach us to be resilient. If we can hold a yoga prose and breathe through this we can learn to be with whatever arises in life and breath through it. In many yoga classes you will be encouraged to breath down into the diaphragm (diaphragmatic breathing - belly breathing) The diaphragm and lungs are connected to the vagus nerve (10th Cranial nerve) which is also connected to the belly, heart and throat. The nerve helps activate the Parasympathetic Nervous System (calm, rest, digest). When we breath into the belly the diaphragm increases and stimulates the vagus nerve which sends a message to the brain to activate relaxation and calm. Slow breathing has been found to increase GABA levels that promote relaxation, helping those who live with anxiety. The Alzheimer’s Research & Prevention Foundation recommend kirtan kriya, which is a type of meditation from the Kundalini yoga tradition for anyone interested in improving their brain function and improving memory loss. Clinical research has shown that practicing Kirtan Kriya for just 12 minutes a day can improve cognition and activate parts of the brain that are central to memory. Replacing the Kirtan Kriya sounds with other sounds, or replacing the meditation as a whole with other relaxing tasks, has not been shown to be effective. Yoga classes can increase your function of social engagement by optimising mental and physical health. If we are socially engaging we open up to a state of emotional regulation but also for those who are vulnerable yoga classes can create a nurturing safe environment. Kathy works with all ages and abilities, whether new to yoga or have an experienced practice she is happy to hear from you. Kathy is an excellent teacher. Her passion and belief in yoga shines through and inspires. Her instructions are thorough, so even an un-coordinated beginner like me can feel a sense of accomplishment and peace! Excellent teacher, excellent class. Having always had poor flexibility, especially my hamstrings, I'm getting very close to being able to touch my toes! Thanks!